In many ways, 2004’s The Incredibles is a cultural touchstone. It’s easy to forget that Brad Bird’s original film was very much ahead of its time. Aside from being a precursor to the MCU and Nolan’s Batman trilogy, The Incredibles set the stage for everything that would follow. With a release that came nearly fourteen years later, Incredibles 2 had a considerable amount of hype surrounding it. As a result, the film had a nearly insurmountable amount of both anticipation and expectation behind it. 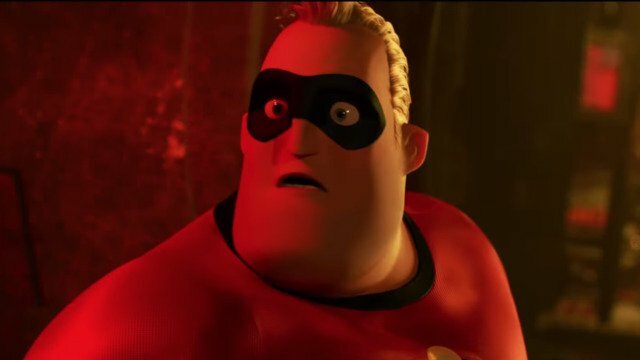 Despite these odds, Incredibles 2 manages to live up to its predecessor – with a few minor exceptions. 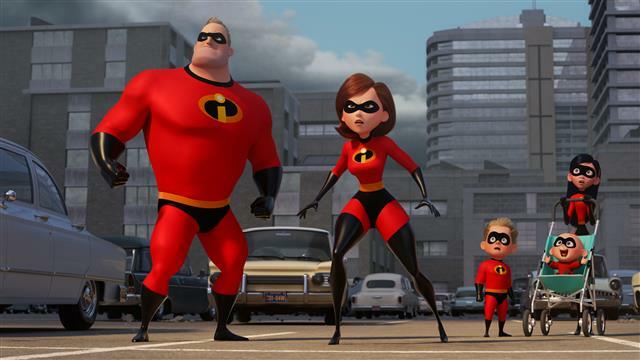 Thematically speaking, what works so well about Incredibles 2 is the way that it adapts to the current superhero craze. Rather than putting the emphasis on the superhero elements, the film doubles down on the family aspect of the series. There’s something to say for how well the role reversal between Bob and Helen works in the story. However, this storytelling tactic also makes the themes somewhat of a re-tread of the original. Sure, there are enough new elements to keep the story and characters relevant. But by the time the credits roll, there’s a feeling that the characters are left in the very same place as the first film. This isn’t to discount all of the great things that Incredibles 2 does, which is just about everything. Truth be told, this film is such a good sequel that it’s hard to really hold much against it. Part of what made the original so special was how timeless it felt. Indeed, The Incredibles told a simple story, but this illusion of this so-called “retro futurism” is unintentionally shattered by the sequel. By rooting the film in the ’60s aesthetics, while at the same time echoing themes that are unique to technological advancement in our time period, it moves the film into slightly paradoxical territory. To be fair, part of the fun of Incredibles 2 is seeing this retro futurism aesthetic on full display. Although not necessarily a bad villain, Screenslaver seems a bit out of place within this world. Not to mention a twist that is feels unintentionally telegraphed fairly early on. Especially when you consider how well Syndrome fit within the themes of the original, the Screenslaver storyline ultimately feels a bit forced and underdeveloped. Ultimately, the Screenslaver is the only slightly weak spot in an otherwise wildly imaginative and thoroughly entertaining sequel. What makes the film unique are the distinct sensibilities of its writer/director, Brad Bird. The action scenes are kinetic and inventive, the character work is on point, and the stakes feel just as high as the first. Bird is able to tread a delicate tonal balancing act, offering mundane elements juxtaposed with fantastical ones. 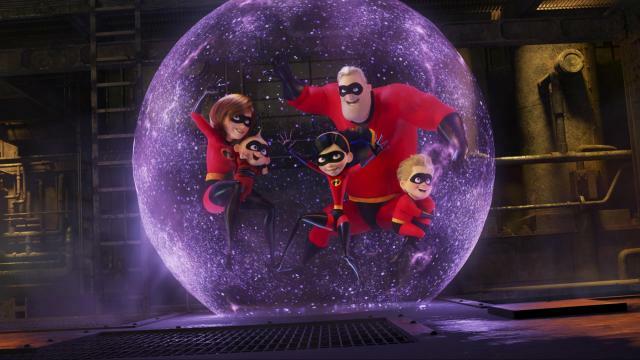 Even if it doesn’t capture the lightning in a bottle effect of the first film, Incredibles 2 manages to use the goodwill of the original in a fun and exciting way. 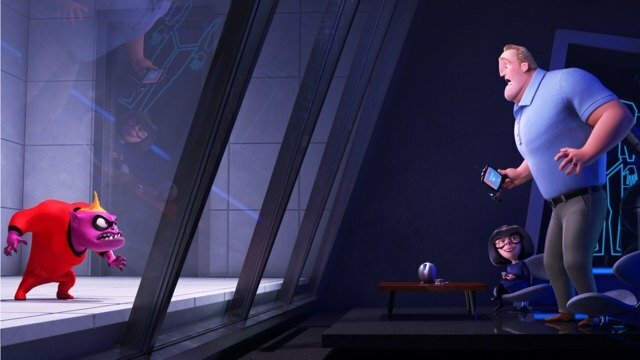 Incredibles 2 lands on home video via a 4K UHD HDR-10 transfer, as well as a standard 1080p version on a separate disc. Upscaled from the theatrical 2K release of the film, this 4K presentation protects the original 2.39:1 aspect ratio. When comparing the two discs, the differences become immediately apparent. Contrast is greatly improved, details in the textures are sleeker, and colors more vibrant with the 4K release. The UHD’s ability to add a significant amount of contrast makes the film feel a bit darker than the standard blu-ray. The suit textures in particular shine on the 4K transfer, offering a significant increase in quality when compared to the 1080p version. The colors – especially during dusk/night scenes – are exemplary on both releases. Incredibles 2 already has a diverse color palate to begin with, but the 4K UHD only enhances the look. While the 4K version is obviously the optimal way to watch the movie, the standard blu-ray isn’t far behind. Although the 1080p version has a slightly milkier image and less dynamic range, it is a solid transfer nonetheless. If there’s one complaint, it’s that the 4K transfer is an upscale. It wonderfully preserves the theatrical release, but most people won’t be able to notice the difference without a side-to-side comparison. For the UHD release, Disney has added a Dolby Atmos track in addition to 7.1 and 5.1 mixes. While the Atmos track adds a few additional channels, the fact that it’s essentially an up convert limits the track. The DTS-HD 7.1 audio mix however, also brings the goods. There’s a great amount of clarity in the mix, and sounds are well separated overall. The low end of the track is a highlight, especially in the third act. Unfortunately, the low end of the mix is so powerful that it can drown out other sound effects at times. If there’s one consistent issue that plagues this mix, it’s that Michael Giacchino’s score often gets buried. The more bombastic elements of the score play well on this track. With that said, the more subtle elements of the score get lost and that’s really a shame. Otherwise, the theatrical mix is pretty well preserved in this track and the sense of immersion is surprisingly well defined. The blu-ray release carries a boatload of special features spread over two discs. Unfortunately, the UHD disc does not contain any of the special features and you must switch discs to access them. BAO (7:41, 1080p): The short film that played before Incredibles 2 in the theater. Written and directed by Domee Shi. Auntie Edna (1080p, 5:08): Written and directed by Ted Mathot, this short explores what happened when Edna babysits Jack Jack. Strong Coffee: A Lesson in Animation with Brad Bird (1080p, 18:50): The most extensive featurette on this release is also the best. While the commentary comes in a close second, this one gives viewers great insight into the mind of Bird. Considering that he is one of the greatest storytelling minds of our generation, it’s great to see what influenced the director. He also offers his insight into the making of the film. The only real problem here is that it’s not longer. Audio Commentary: This one is slightly deceptive. Although Bird introduces the commentary, he quickly hands duties off to Animation Supervisors Dave Mullins, Alan Barillaro, and Tony Fucile. Joining them is Animation Second Unit and Crowd Supervisor Bret Parker. This is a fascinating nuts and bolts approach to the making of the film. With that said, if you’re looking for insight from Bird, you’re sure to be disappointed. Bird’s absence isn’t necessarily a bad thing, it’s just important to know what you’re getting going in. Bonus Features: Five individual featurettes that don’t really have anything to do with one another, but cover different aspects of the film. Each is pretty self-explanatory. Heroes & Villains (25:35, 1080p): Various talking head interviews intercut with limited BTS footage catch viewers up with the characters. There are some interesting tidbits here, but these featurettes are pretty much paint by numbers. A play all function is included. Vintage Features (1080p): A series of short 30-second promos and theme songs for the OG superheroes. There are two per character, although they contain minuscule differences. These would have been great to promote the movie, but they add absolutely nothing to this release. Deleted Scenes (39:44, 1080p): There are a healthy amount of deleted scenes on this disc, supplemented with short introductions from Bird. All of these scenes are in storyboard form, but it’s fascinating to see the various attempts to open the movie. Aside from these alternate openings, it’s pretty easy to see the reasoning these scenes were cut. Trailers & Promos (1080p): A surprisingly small, but straightforward collection of marketing materials. Overall, this 4K UHD release of Incredibles 2 does the film justice. If you are a fan of the franchise or Pixar in general, this is a must own. Indeed it’s a solid release, but the true question is whether the 4K package is worth the price jump. The answer to this really depends on where your interests lie. The average viewer probably wouldn’t be able to tell the difference between the two. So if you’re just a casual film viewer without a 4K setup there’s no need for the upgrade. On the other hand, people looking for the best possible picture quality will notice an improvement with contrast and saturation in particular. If it weren’t for the lack of a Bird commentary and some sort of retrospective, this disc would surely rank much higher. Despite these unfulfilled expectations, the disc is recommended nonetheless.